Forgiveness does not come easy for most of us, it is a choice that we make. Colossians states, forgive as the Lord forgave you. Our family went through a situation and there was wrong on both sides. I wanted forgiveness for my family, but I couldn't expect that unless I forgave the other parties. Was it tough? Yes it was. But I realized it was right to forgive and that I would heal much faster. That my whole family we would heal faster. And we did. I don't forgive people because I'm weak, I forgive them because I'm strong enough to know that people make mistakes. This is fantastic! :) Love it Nonny! This is really awesome. I don't have such a hard time forgiving, but I do have a hard time allowing myself to be put back in the same situation (where someone can hurt me) so I tend to steer clear of the people prone to doing it, and that comes across as a lack of forgiveness. I'm trying to find a way to work on that but am never really sure what to do. Wonderful message! 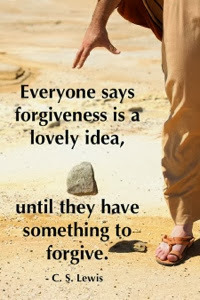 Forgiveness isn't easy but it does a world of good when one learns to forgive. Being consumed by a lack of forgiveness affects one's health. I love to receive comments from readers! Thanks for taking the time do so! Neglect? Or Just Focusing on Me?!? Family Fridays #3: Easter Fun!